PowerForms is a multi-effect submission form module. It is able to use ordinary, grouped, collapsable effect etc, and easy to switch between these effects. 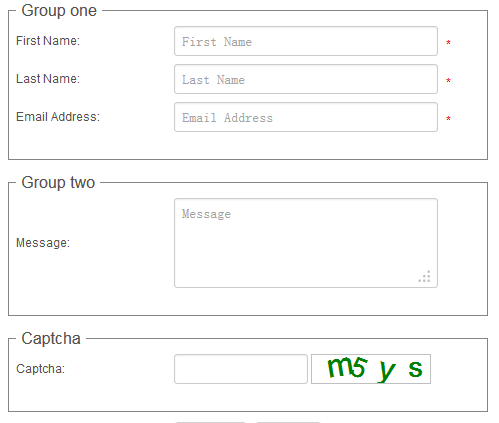 You can set the form module to own different functional modules like contact us, order product, collect polls etc. It can be set to allow email notification to both parties after the form submission and redirect to a specified page or download a specified file. There are 17 common-used controls in the module, easy for the user to input relevant data. The super powerful jQuery validation Engine ensures the security and convenience of data verification. Support multiple form effects, support to add more form effects through a new version upgrade. Support different theme styles switch through a single effect. Support the appearance control through setting parameters. The type and quantity for the parameters of each effect is separate. Support 18 input control type support 10+verification type. Support jQuery validation Engine, data verification friendly and secure. 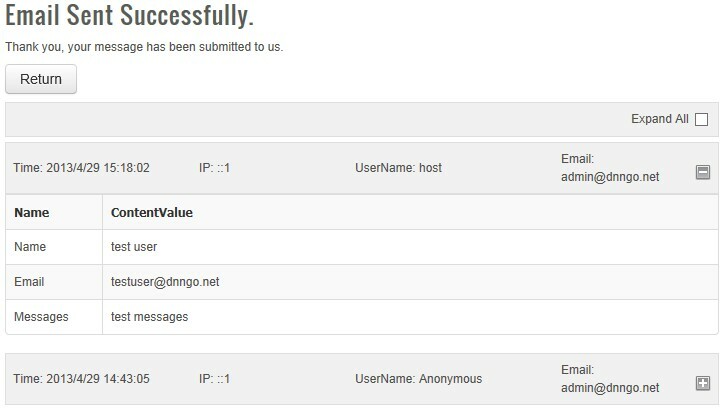 Support to display the logged-in user's name, mail address, country etc in the control. Support email notification to both parties after the form submission. Support a wizard form interface, support grouped forms. Support to import/export the custom filed, back up and restore the filed in a more convenient way. Support data export,, allows to export the collected information as cvs file. Support the temporary storage of the un -submitted form at the input state of the form, and avoid the data loss when closing the page. Support verification code, double verification of ajax and from. Support multiple PowerForms modules on one page. Support Premium User to have access to more form effects through a weekly update. To use xBlog, you must be running DNN 8.x or higher. 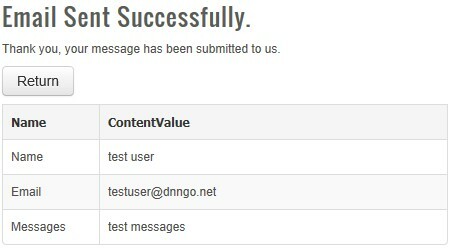 We have tested it with DNN8.x and DNN9.x. Navigate to find the "DNNGo_Powerforms_x.x.x_PA.zip" file on your computer and click "Next" button. Name - This is a field name and not used to display on the form. Only characters from a-Z and 0-9 can be allowed. Same words are not allowed to use for the names. Alias - Texts here will be shown in the form. ToolTip-To set tooltip texts for the fields. There are totally 17 types of control included in the module, You can define different control types for each field. 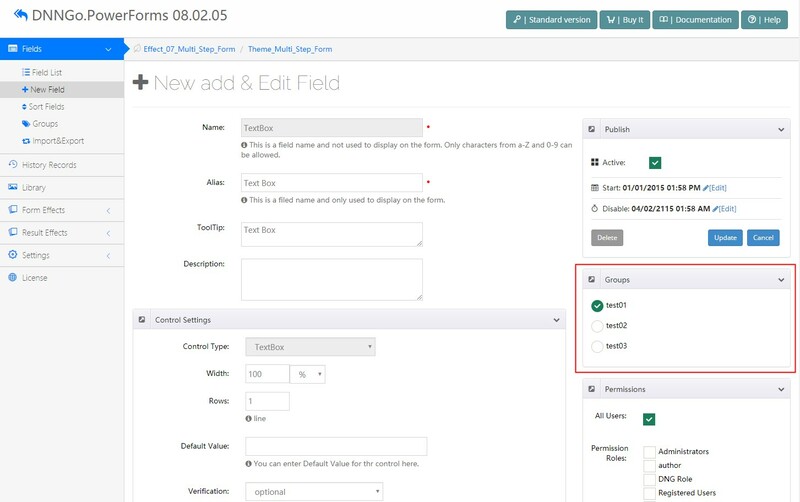 Control Type -To set types for the fields. Width - To set width for the the control, normally set to 100%. Required - To set whether it is required. You can set width for each field. You can set width of each of the three fields to 33%, so these three fields will display in one line. You can set view permission for each field. To set whether the fields will be included in the email templates. This module contains 17 controls, now we will elaborate on the use for these fields. This field allows user to enter text in one or multiple lines. Width -To set widths for the controls. Rows is for the height of input box, for instance, it will show with multiple lines if you set it to 2, then you can enter multiline text. 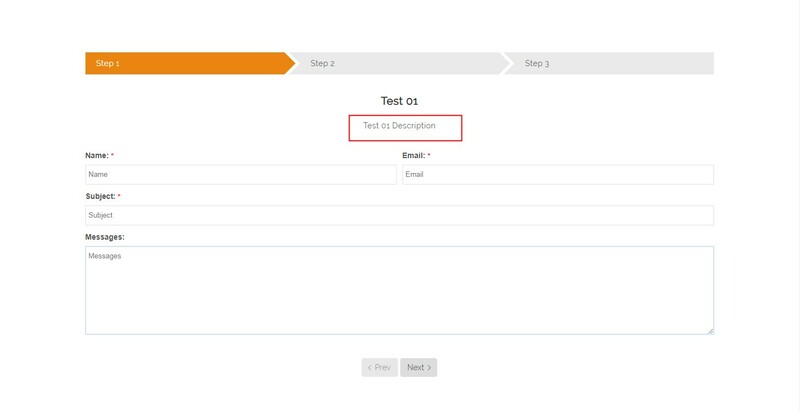 Default Value - To set default value in the input box..
Verification - You can set up different validation for the field, for instance, when you choose Email, it will only allow to enter correct email address. Required - To set whether it is required.. Equals Control - Another field can be set as the equivalent fields. Only when the values of the two fields are the same can users submit forms. Max Length - To set the number of characters for the input box.. This control will show the DisplayName of current user once he/she logs in. 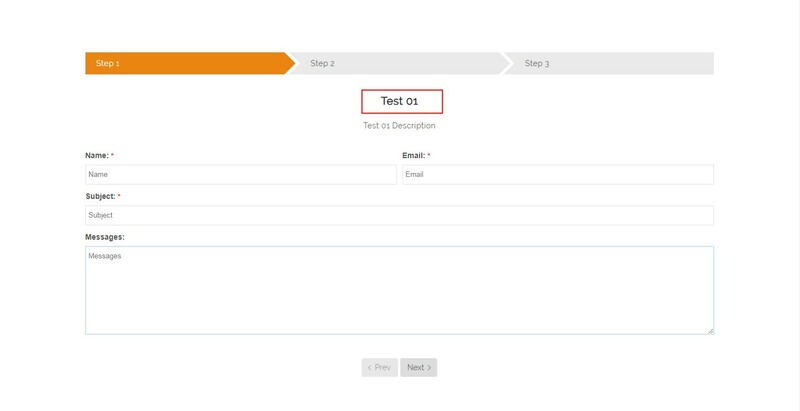 This control will show the Email of current user once he/she logs in. You need to use this field to collect emails of submission users, otherwise, submission users will not receive emails. This control allows you to enter some complicated text, which could be links or images. You can enter multiline texts in List Collection, each line text stands for an option. You can enter a default value in Default Value, which must be option included in the List Collection. You can enter multiline text in List Collection, each line text stands for an option. You can enter one or multiple default values in Default Value, multiple values should be separated by comma. All the default values should be option included in List Collection. Direction - To set the direction to display. Column - You to set number of columns for the control and it is valid only when Horizontal above is selected. 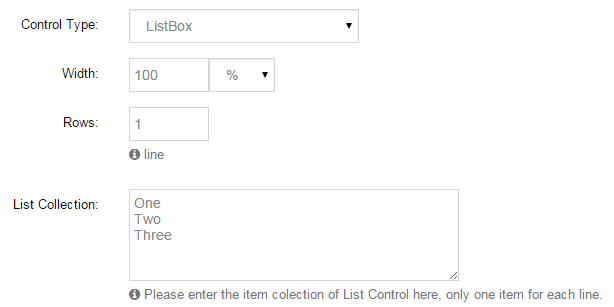 List Collection - You can enter multiline text in List Collection, each line text stands for an option. Default Value - You can enter default values in Default Value. All the default values should be option included in List Collection. 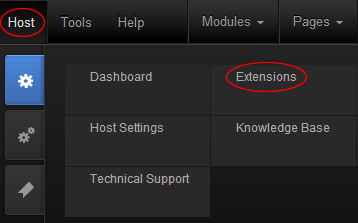 Users can upload an attachment through this field, and set File extensions through Host > Host Settings > Other Settings > Allowable File Extensions. You can view the file uploaded by user through History Records. Users can upload multiple attachments through this filed. You need to fill in the prompts for CheckBox in ToolTip. 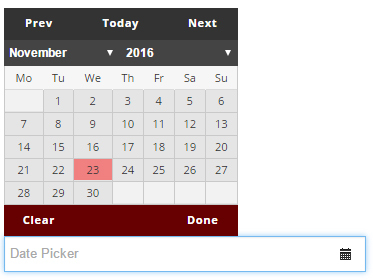 You can select a date easily through this control. You can enter some texts in Default Value, the texts will display on the form as description. This control contains option from all over the countries. 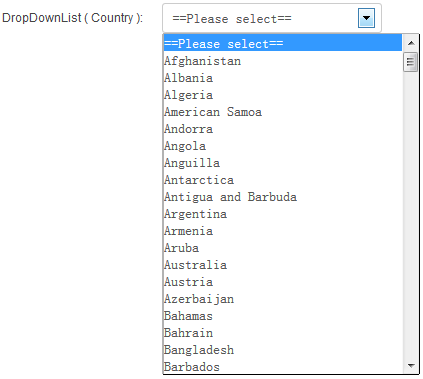 To set the states which corresponds to the country, you need to have the country field selected in Associated Control. This field allows user to choose an address to send email. For instance, if one user chooses Address2, the submitted email will be sent to email bonded with Address 2, which is dnnskindev@gmail.com in this case. Some texts or HTML codes can be added. Default Value - You can set whether the default is not checked. Only 2 values can be filled, true and false. 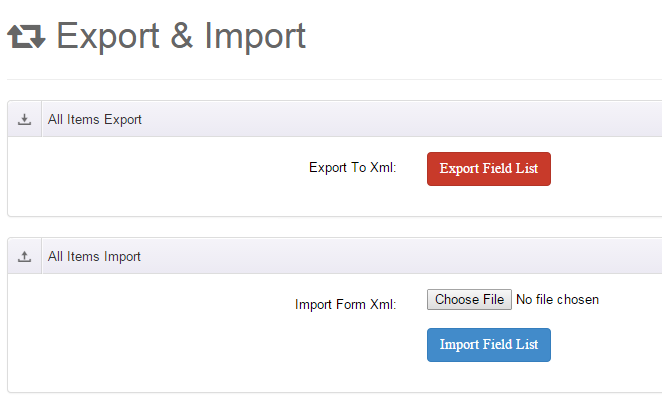 You can import/export data in this module, please note import will clear all the existing fields. You can drag the controls to sort fields. You can view all the submissions through Submit History, also you can search the record at specific times. Administrator is able to export and check the data in an easy way. Enter a time in BeginDate and EndDate and click Search, then the submission during this period will come out. Delete is to delete the info selected. Expand All is to expand/ contract all info. Form Width - Set width for the whole form , 100% width as recommended. Label Text Align - Set title alignment, left-aligned or right-aligned. Prompt Position - Set the position of prompt box. Submit Button Text - Set texts for submit button. Submit Button Image - You can set Submit button as an image. The module contains 7 effects in all, and every effect is different, you can use it according to your needs. Forms Style - Set the form style. Forms Size - Set the form size. Forms Color - Set the form color. Forms Align - Set the alignment of the fields. Display controls in one row - Set whether to display the fields and button in the same row. You can use this effect to display some fields in groups. You need to add some groups in Groups. 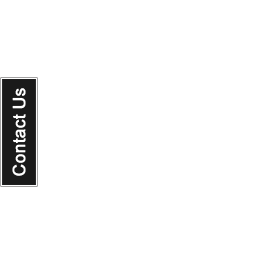 You can use this effect to display the form fields as Lightbox. Also you can set the animation in Lightbox through Form Options interface. There will be a Contact Us button on the left side of the screen, the form will display as Lightbox on clicking this button. Also you can set the animation in Lightbox though Form Options interface. Each group represents one step. Group Name - Set the title of description area. Description - Set the content of description. Anchor Title - Set the titles of steps. 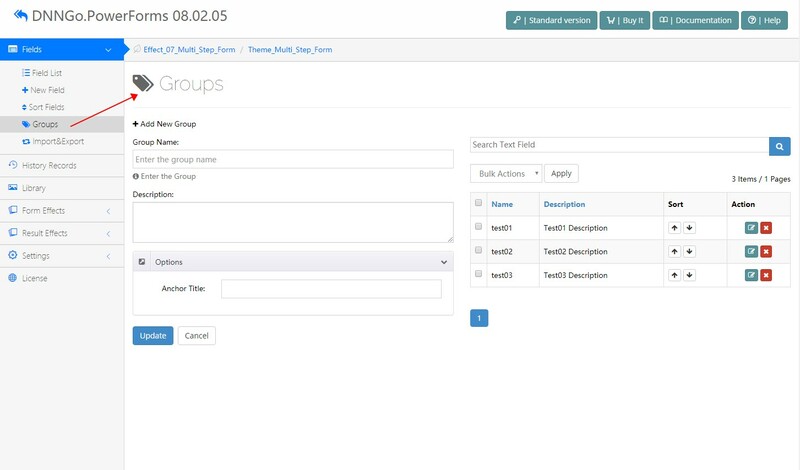 Last, you need to select groups for the fields. Find HTML for external links in Form Options. Find HTML for external links in Effect Options. Insert this HTML to any module. The link can be image or text. data-text - text for the link. data-image -URL address for the image link. Result_01_List - This is a common way to display the result. Lists per page - You can set to display how many data could display in the history submission interface here. Redirect results page - You can select a page and the user will be redirected here once the form is submitted successfully. Anchor link - Anchor position for redirecting to result page can be set, no # is needed. Extra Tracking - You can enable this parameter to obtain more tracking records, for example:"Form Page URL","OriginalReferrer","Landing Page","User Agent / Browser"
Export Extension - To set the format for exported files. Date Pattern - To set the date format. Hide IP address - To hide the last two digits of the IP address. Form Version - It will only be allowed to fill out the form once for each version if you set version identifier. Only numbers are allowed to be version identifiers. Login User Display - Form is only visible to users who are logged in. Prompt Not Logged - Prompt that users have not logged it. 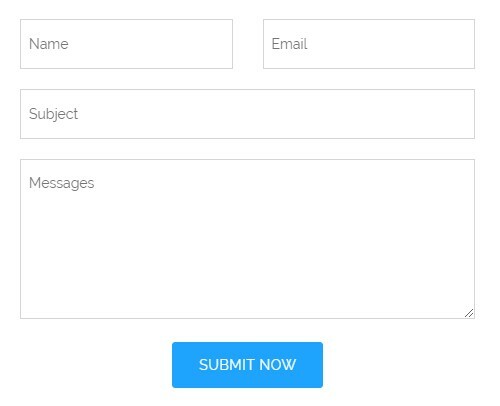 Prompt Already Submitted - Prompt that users have already submitted the form. Max file size - To set the size of uploaded files. Clear temporary files - You can clear the useless files of the temporary folder on multiple file upload controls with this button. Schedule Enable - To enable the feature of regularly cleaning up logs. Days Before - To set the number of days to keep logs. Max Feedback - To set the number of records that the log holds. reCAPTCHA Settings- It has integrated the reCAPTCHA of Google in the module, which will prevent spam effectively. Hidden fields encrypt Settings - It can block spam mails without affecting user experience, and will verify uniqueness to prevent multiple submission. If you can still receive spam mails when enabling this feature, you need to increase Verify Interval Time properly. Custom 'From' email address: - Set the email sender. 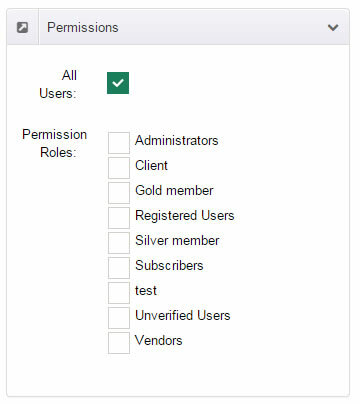 Administrator Roles Email - To set the user roles for receiving emails. Send to submit user - To set whether to be sent to the submitters. 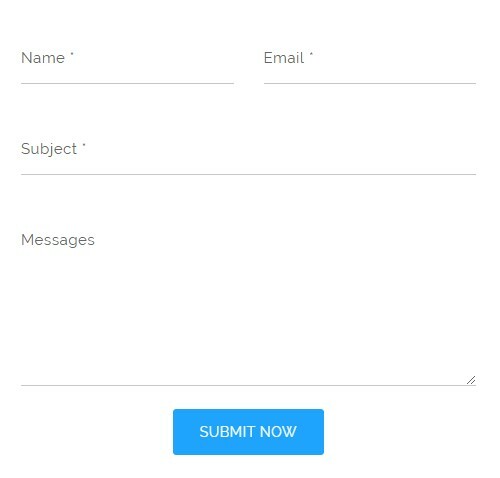 Submit User Email - To set email fields. Reply To - Email received by the Administrator can be replied to the form submitter directly. This feature may not work properly due to some ISP. Email Content Template - Admin is able to designate the content and template to be sent. Added start and end time limitation feature of custom fields. Fixed the issue of some settings losing because of copying module and other pages under some DNN versions. Fixed the bug of module license error at some circumstances. Fixed the bug of management list header being not able to sort. Fixed the BUG of reset button being not able to reset the validation prompt. 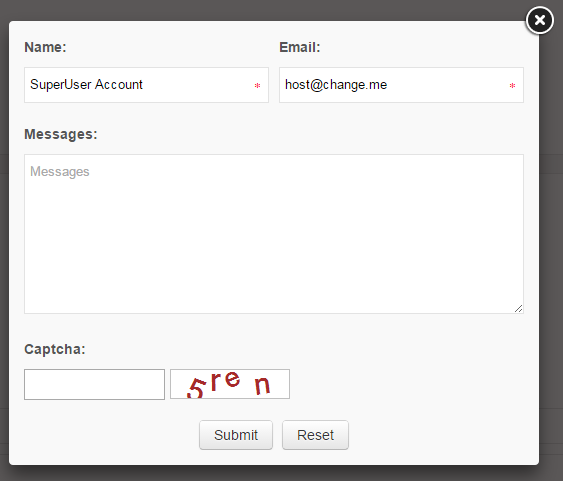 Changed the default settings of email sending to enable sending email. Added the feature of exporting records regularly and sending to designated email. Changed the Effect_08_ExternalFancyBox to be displayed in iFrame form. Fixed the issue that the type of some data fields being unreasonable. 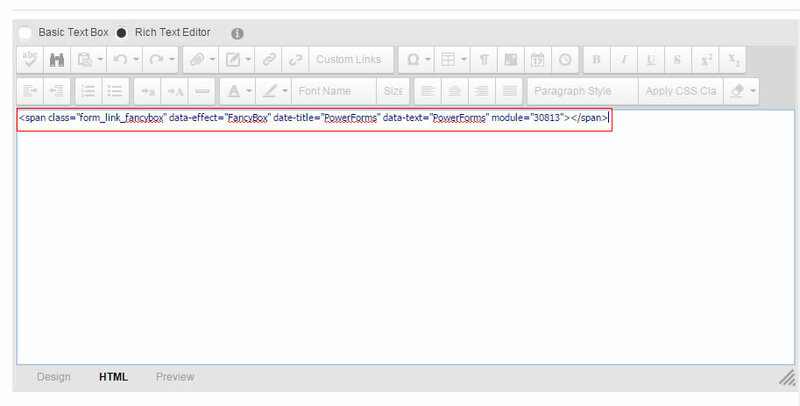 Added the push data feature, which allows you to submit form data to custom pages. Optimize the option of push data setting interface with rich custom options. Added the feature to export all sumitted history records at one time. Fixed the issue that email notification can’ t be sent correctly under certain runtime circumstances. 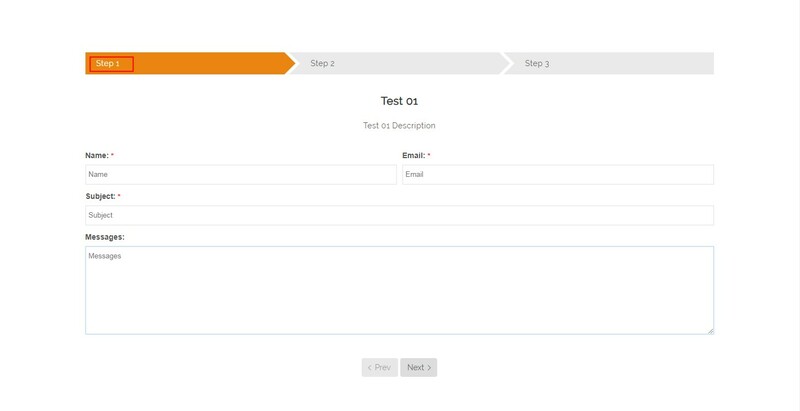 Added two sets of form page templates.